If you’re wondering where Part 2 of the Photo Tips Friday: Give Your Blog a DIY Design Makeover post has got to, it’ll be up on the blog this Friday. I’ve had to do a bit of a shifty about with my schedule, as I’ve got something reeeeeeeeally exciting to share with you on Tuesday – something to do with a giveaway and a lot of money. I’ll see you back here for that, then…? Love this outfit and lovely style. 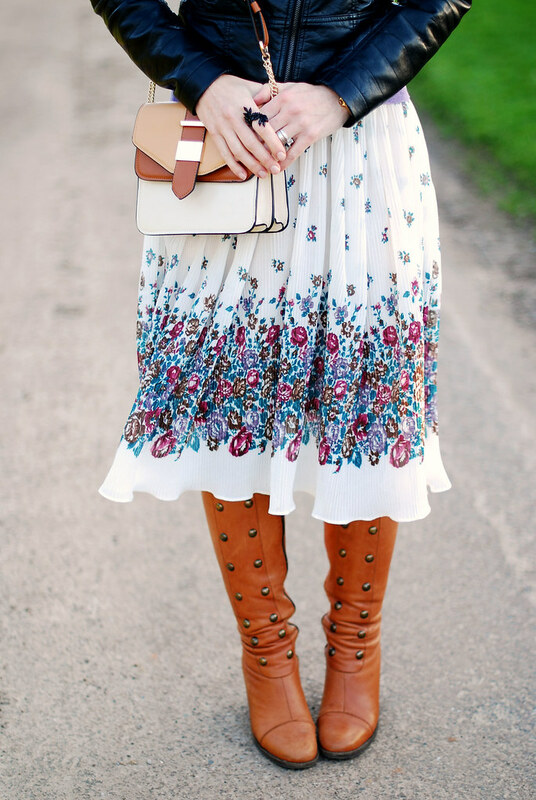 im in love with it …..
You can weather those boots and jacket with ANYTHING! Love them. Lovely outfit and lovely blog. I don't know why it's taken me so long to follow your blog. I barely wear skirts in the winter to, for the same reason that I don't like to be cold! I love the leather with the floral, though! I love a light summer dress with a leather jacket! Gorgeous outfit, gorgeous you! Those boots! They are ridiculously fabulous! I love the mixed leather colors and the swingy skirt. Great combination of textures. I love a look that is both flirty and edgy. And that purse is beautiful! LOVE those boots! Happy to have found you through WIWW – new follower! Funny you say the dress is hiding under there – I particularly love the earrings that I see peeking through too. Will be watching out for the exciting news (but especially the tips!). Absolutely STUNNING! I love and would wear every piece of this outfit. You have a gorgeous style and an eye for beautiful details and items that standout and blend in beautifully. Some seriously sophisticated print and texture combinations. Really good looking, and I see why you wanted to put all this in one charming outfit. I (we all, I'm sure) always look forward to your styling lessons. The look is so romantic and feminine-love it!!! You styled it beautifully!!! By the way I'm hosting a link up party and would be thrilled if you decided to participate! Loving those studded boots lady! so glad were in the giveaway together! Sartorial genius (as is your standard), Catherine! I love the contrast of masculine and femme with the play of the leather pieces against the sweet, delicate florals in the skirt. 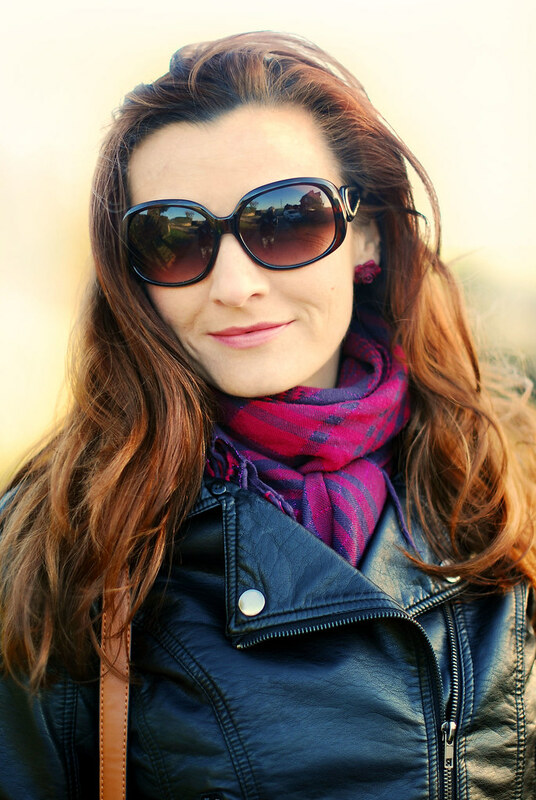 And the color of the scarf peeking out is so beautiful with your coloring! I love your skirt! And you are gorgeous! So happy to have found your blog. Love the vintage dress/skirt and the structured purse is great! 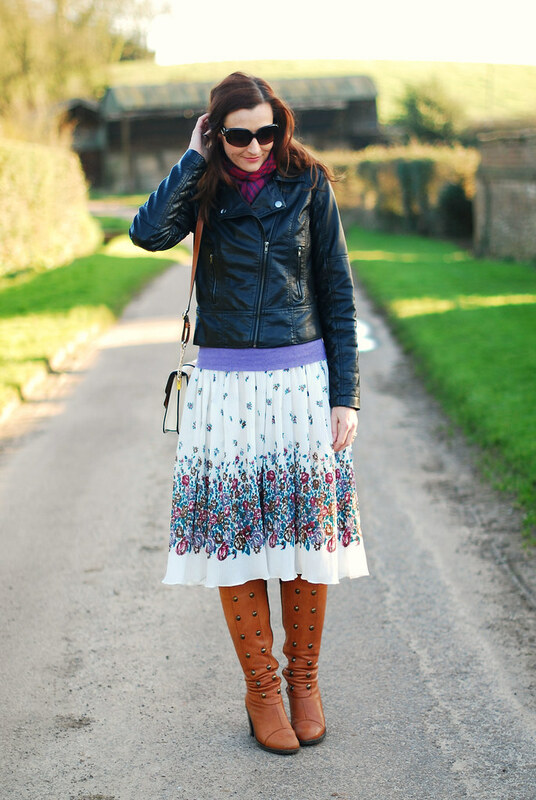 Love the leather jacket + pretty skirt combo! Please Catherine wear more skirts, you look sooooooooooooo gorgeous in them. This is great — tough and sweet at the same time. I absolutely love those boots! I love the jacket with the skirt! Holy smokes – I am drooling over those boots! I so agree with you! I hardly wear skirts and dresses in the winter…but come summer time, that's about all I wear! Here's hoping warmer weather gets here soon!! Unfortunately there are never enough warm summer's days. Layering is a great idea. The boots look great. The outfit is wonderful. This makes me long for Spring! Love hard and soft Catherine, I always feel like it's the perfect mix for an effortless look..loving the jacket and as usual your gorgeous hair!